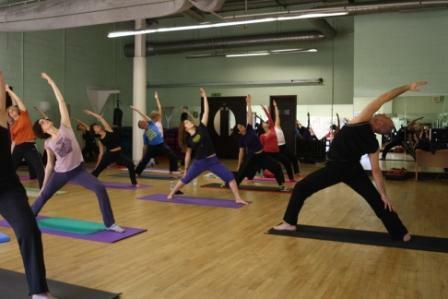 For the fourth year running, Heather George and Tony Davis organised special Yoga classes as part of World Yoga Day to raise money for UNICEF on Sunday 30th January at River Bourne Health Club, Chertsey. 42 Yogis and Yoginis took part and others made donations raising a total of £500 with money still coming in. Tony provided an introduction to World Yoga Day and the particular UNICEF programme that is being supported this year and then two classes were provided by Heather and Jean-Claude Rawady. World Yoga Day is a 2 hour Yoga practice from 11am to 1 pm in every time zone around the world thus leading to 24 hours of continuous Yoga to support human rights. We joined 272 other Yoga schools from 32 countries. It started in New Zealand, then crossed Australia, Thailand, mainland Asia including Russia and then Scandinavia, the Middle East & Africa and into mainland Europe. As the United Kingdom, Portugal and Ireland joined there were 165 schools all practicing Yoga at the same time. As we finished we handed over to Uruguay. Then classes spread across South America, Canada and the USA. The final classes were held in Portland, Oregon. The only continent not represented was Antarctica, has anybody thought of offering Yoga for penguins ? The initiative that World Yoga Day is supporting this year is a UNICEF programme to bring clean water and sanitation to the Tigray region of Ethiopia. Within living memory, Tigray was a lush farming area that fed its 3.7 million population, but no longer. Its decline has a number of sources: the 30 year war between Ethiopia and Eritrea, deforestation due to poor land management causing erosion of the top soil and unpredictable rains due to climate change leading to both droughts and floods. All of this has turned it into a dust bowl with just small pockets of farmable land. There are many initiatives to help the people of the region become more self-sustaining. The one we are supporting is focusing on 6 districts of Tigray and a further 72 in the rest of Ethiopia totalling one million people. In some areas women had to leave their villages before dawn to walk miles to a river, that was often polluted, to get water for their families. This put them in great danger, not only from wild animals. The UNICEF programme has been helping villagers to dig wells and provide pumped water from them. In 2000 only 28% of the rural population had access to clean water, it is now 50% aiming for 85% by 2015. Under 5 mortality is 109 per 1000 births almost half these deaths are caused by diarrhoea or other diseases due to poor sanitation. UNICEF have been educating villagers in basic hygiene and helping them to build latrines. Indeed 750,000 have been built since 2006. As a result, the number of homes with latrines has increased from an estimated 60 to 90 per cent. The money we raise will help to build more. Heather and Tony would like to thank all those that participated or made donations, Jean-Claude for his great class and also Graham Dollery and the staff of River Bourne Health Club who worked so hard to create a welcoming environment. Yet again they provided their facilities for free, so that all money raised would go to the charity. Within the EU a European transfer is free. All you need is the IBAN and the SWIFT-BIC Code.